Aliens: Colonial Marines has been one of my most anticipated games every year for over half a decade. My love of anything distinctly related to Xenomorphs, as well as my general high regard for the majority of Aliens games released over the years, made it a sure winner in my book. At the start of every year, it made my "most wanted" list, but every single year, it was delayed, consistently pushed back for one reason or another. Rebellion's Aliens vs. Predator, released in 2010, was a playable but disappointing runner-up, and I remained convinced that, with Gearbox's guidance and love for the license, Colonial Marines would be the Aliens game I'd waited for my whole life. Boy, do I miss Rebellion's Aliens vs. Predator. Aliens: Colonial Marines famously considers itself the canonical sequel to Aliens, but the quality of its campaign reduces such a claim to little more than arrogant posturing, as this bumbling fan fiction dares compare itself to one of the most respected science fiction horror films of the 20th century. It barely deserves a comparison with Battlefield Earth. Clocking in at just under five hours, and containing very little in the way of actual story, Colonial Marines quickly establishes itself as nowhere near notable enough to be the "true sequel" it claims to be. While it indeed takes place aboard the Sulaco and LV-426, the actual plot devolves roughly into the same tired "Marines meet Xenomorphs, get slaughtered, fight Weyland-Yutani for a bit, then kill a Queen" storyline seen in almost every other Aliens game. Characters are barely distinguishable from each other, containing no trace of the strong personalities and personal terror one would expect from a true Aliens story. Instead, we get archetypal soldiers who say "Hoorah" every few minutes to remind you they're totally soldiers, and a main villain introduced in the final cutscene of the game. Dialog is embarrassingly puerile, and couldn't be more full of gung-ho machismo tripe if it tried. While the original Aliens dissected its posturing "manly man" stereotypes, and showcased how utterly frail a cowboy mentality can be when everything falls apart, Colonial Marines revels in its own testosterone, submerged gleefully in a pool of dank ultramasculinity. This is a game that unequivocally misses the point of Aliens, which wouldn't be so bad if it hadn't already had the gall to insist it was a true followup. Only Aliens vs. Predator: Requiem could claim to be a worse mishandling of the series' lore. Perhaps the most disgraceful element of Colonial Marines' story is a plot twist ham-fistedly forced into a late chapter that, for fear of upsetting readers with spoilers, I cannot adequately detail. Suffice it to say, the story undoes canon established in the movies, and does so with such casual disregard, it comes off as an insult to the audience's intelligence. When one character points out a fatal plot hole in this awkward twist, the revealing party actually says, "That's another story," and it's never addressed again. This is how much Colonial Marines respects its own ideas. The unremarkable plot, and even its desperate retcon, could be forgiven if the game was good enough to back it up, but unfortunately Colonial Marines is a tepid experience that starts off promising, contents itself with unimpressive arcade action, then abruptly spits the player out with a rushed ending and an absolutely laughable final boss. At first, the campaign does an excellent job of building up atmosphere. Environments are authentic and look gorgeous on a PC, with excellent attention to lighting and a beautiful presentation of an infested Sulaco. The mounting tension toward the first Xenomorph meeting is palpable, and the initial encounter is impressive, pitting the player against a quick-moving "Lurker" genus that keeps hiding in its resin-coated nest and attempts multiple sneak attacks. This first fight is intimidating and contains everything one would expect from a frightening Xeno battle. It is also the first and last time Colonial Marines ever successfully attempts such a thing. After this first fight, the game settles into a formulaic and utterly brainless shooter that tosses out Xenomorphs haphazardly and encourages nothing more involving than the most basic of run-and-gun tactics. Battles are pitifully easy, and the motion tracker is never really needed, since the thin corridors and wide open spaces negate the need to ever locate attackers. The aliens themselves are content to run directly into your bullets, with the occasional random, silly looking jump maneuver to give you the impression they're conscious of danger. In some levels, they'll even stand frozen in place, completely static character models just waiting to be shot. Moments that could have been excellent fall completely flat on their face due to an understated presentation and total failure of execution. 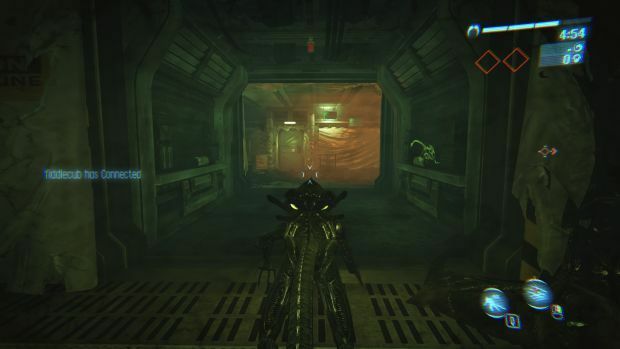 One stealth segment, in a sewer full of blind and explosive Xenomorphs (that walk like they're holding in a lot of feces), promises to be tense stuff, but the enemies are so stupid they're basically harmless, and the "stealth" consists simply of walking slowly through a dreary corridor. A power-loader battle is hinted at from the very beginning of the game, but once you finally get into the unwieldy thing, you simply mash buttons in the vague direction of your enemy over and over again until it's dead. Then there's the final battle against the Alien Queen, which consists of pressing a few buttons on a machine -- and that's literally all you do. Though environments and models are impressive at first glance, everything falls apart once they start to move. Animations are jerky, messy, and incomplete, with Xenomorphs awkwardly disappearing in globs of half-rendered acid blood when killed or getting snagged on scenery before launching into glitchy spasms. Some transition animations seem totally missing as character models instantly switch out for more battle-damaged versions in plain view of the player. Allied NPCs are left similarly wanting, guided by an A.I. that regularly makes them walk into walls or wander around a room, slightly lost. Ally characters disappear and reappear in front of you from a cloud of blue light if you so much as move a few meters ahead of them, so unwilling is this game to animate anything if it doesn't have to. 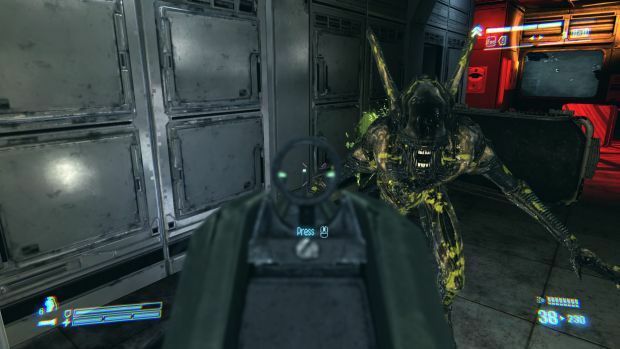 Xenomorphs and Marines often fail to recognize each other, with enemies running straight past squad mates in a bid to attack the active player, giving off the feel of a poorly scripted pantomime rather than a believable battle scene. 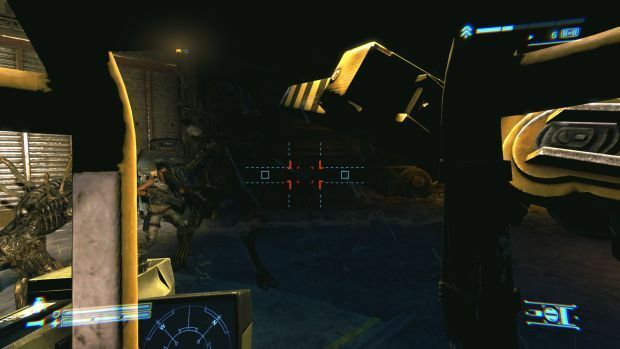 Once Weyland Yutani mercenaries are introduced, the action slows to an agonizing crawl, attempting to be a cover-based shooter despite lacking a cover system. Ranged gunfights feel like the very worst of mediocre 90s first-person shooting games, and the terminally unintelligent opposition would be almost amusing if it didn't make for such excruciating dreariness. An overwhelming sense of disconnect is felt when playing the campaign. A player's movement, a weapon's gunfire, and the Aliens never feel like they belong in the same game. You're shooting a Xenomorph, but there's no sense of impact, the game lacking the visual and audio capability of making it feel like you actually killed your enemy. Nothing bears any gravitas, there's no sense of weight. It's the same feeling I've had when playing an alpha build of a game in preview sessions, before the developer managed to add the official sound files and animations to tie everything together. 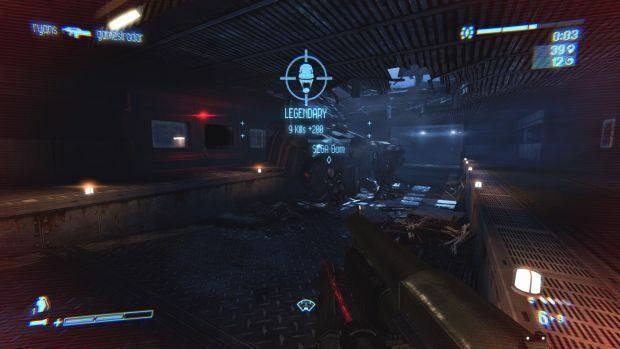 Colonial Marines is a jumble of audio-visual elements that dance around each other, but never connect. Then there are the little details, or the complete lack thereof, betraying just how unpolished the overall product is. In the first chapter, a Marine dropship crashes into a hangar, in what's supposed to be a dramatic and exciting visual setpiece. It's hard to stay engaged, however, when the pilot is sitting motionless in her cockpit, arms fixed rigidly to her sides like a Playmobil figure. Another time, a fellow Marine checks her motion tracker, but the tracker's screen is completely blank and mute. These totally overlooked aspects are small on their own, but combine to regularly derail any attempt at crafting a convincing experience. So far, everything I've said applies to the PC version. On consoles, the experience is startlingly worse, lacking even the beautiful environments as a meager saving grace. 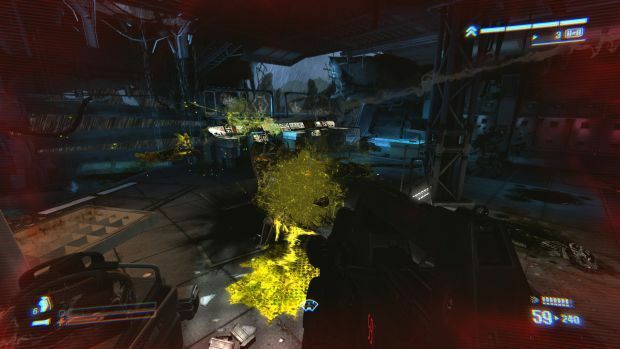 The Xbox 360 version of the game is riddled with hideous screen tearing, flat textures, and blocky artifacts covering surfaces. Swinging lights and broken pipes don't so much sway from the ceiling as they do shift from left to right in segmented blocks, unable to give us a fluid swinging animation correctly. The consoles pack all the problems seen on PC, with the added "enhancement" of grotesque graphics. If you think co-op will help boost the entertainment value -- hold that thought. Cooperative play is an afterthought at best, tossing up to three generic marines into the mix, with their own jerky animation and glitches. Team members move around in stuttered jumps, and there are issues with multiple users trying to open doors at the same time and being unable to shoot for a limited amount of time. Outside of a revival option, there are no team interactions, adding to the numbing arcade feel of the entire package. Co-op, indicative as it is of this game's problems, has been roughly shoveled into the core game with little regard for cohesion or common sense. If I'm to praise anything, I will say that the game has a nice leveling system. As the player accrues XP and ranks up, new attachments can be purchased for weapons. Experience is earned by killing enemies and completing challenges -- specific goals to be accomplished at any point in-game, such as shooting a certain amount of Xenomorphs crawling on walls. What really makes this system click is the fact it carries over into multiplayer and co-op, making for a unified experience across all modes. It's just a shame this is the only "unified" aspect of the game. The campaign is a mockery of the franchise, but multiplayer makes for a far better experience. Not a good one, but noticeably superior. Pitting one human team against an alliance of Xenomorphs, online competition threatens to be a tense, thoroughly entertaining experience. It falls short in many basic areas, but at least it approaches levels of acceptability far beyond the means of the solo adventure. 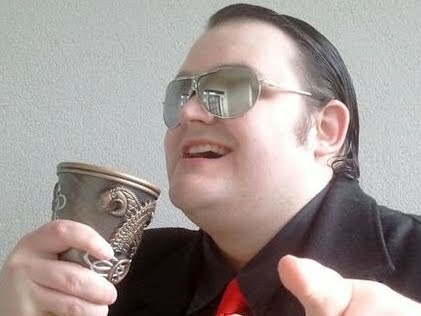 There are a number of fairly standard game types, from simple deathmatches to capture-and-hold and elimination based modes, and they all work as you'd expect. The real twist, of course, lies in players taking turns to be the enemy. When playing as a Marine, you get to keep your experience and loadouts acquired during the campaign, and may thus be armed with pulse rifles, shotguns, and a range of pistols. 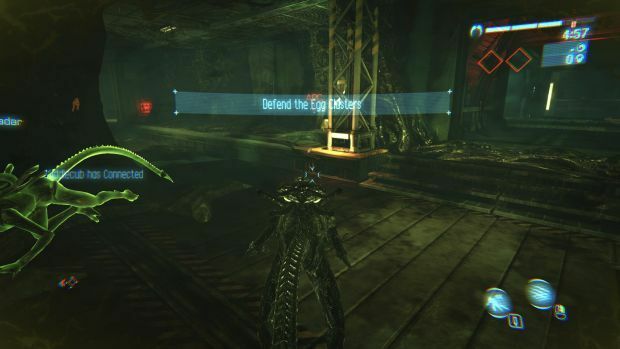 When spotting an enemy at range, the Marine will dominate Xenomorph players, so Aliens must make good use of vents, ceilings, and shadows to break apart and ultimately destroy the opposition. In the hands of players who know what they're doing, both sides are surprisingly well matched, helped in part by the three playable Xeno classes that compliment each other nicely. As well as regular Xenomorph warriors, players may choose ranged Spitters and stealthy Lurkers, each one boasting customization options and new attacks to be unlocked as they rank up. Marine and Xenomorph ranks are logged individually, so you'll need to acquire kills and complete objectives successfully as an Alien before getting access to advanced execution moves, genetic mutations, and silly cosmetic alterations. 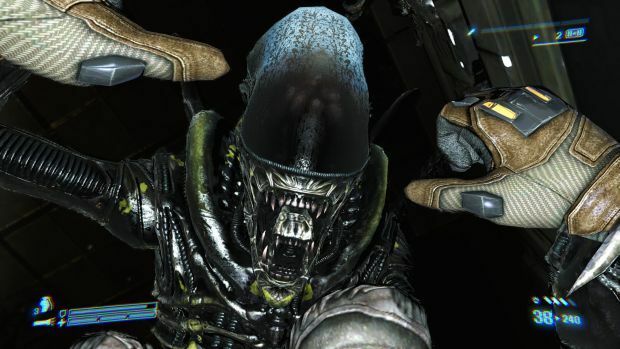 During the game, one Xenomorph player may also earn the right to play as a Crusher -- an oversized monster capable of ramming its victims and dealing horrific amounts of damage. Whether on your side or chasing you down, Crushers are a rather amusing addition. The downside is that, while playing as a Marine can sometimes be an enjoyable experience, the Xenomorphs generally aren't much fun to use. They move slowly, even when mutated for faster movement, environments are nowhere near intricate enough to find many good hiding places, and attacks are fairly unimpressive and bland. Sure, getting a Spitter in a good location and launching acid at prey will net you a great killstreak, but it doesn't alter the fact you're just sat there, repetitively hurling slow-moving globs of goo until someone eventually finds and kills you. As painful as it is to say ... I really dislike getting to play an Alien. As with the campaign, sloppy animation comes into play -- the camera can't handle it when Aliens run on walls, even with the third-person perspective, and some animations, like the Spitter's jump or a number of execution attacks, don't seem to be finished and instead look clumsy. Having a Xeno transition from walls to ceilings is a clunky, unpredictable affair, and sometimes the creatures will just fall off whatever surface they've clung to. The general disconnect between player actions and the world around them is negated somewhat by a more dynamic opponent, but it's still there in abundance. The multiplayer sometimes approaches something resembling entertainment, but overall it's simply not worth paying for. It's about half as decent as the online mode found in Aliens vs. Predator, which is far cheaper and way more polished. Plus, the Aliens feel a lot more deadly in Rebellion's effort, and a lot more like Aliens, rather than the sluggish, convulsive creatures Gearbox tries to bring to life. 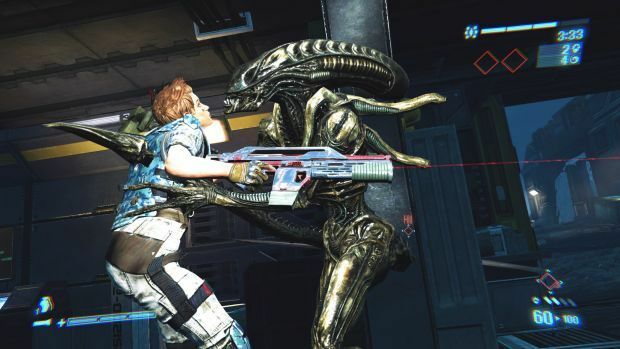 Aliens: Colonial Marines is more than a disappointment. It's downright depressing. I can't say if it's the result of a lacking budget, rushed development, or sheer carelessness, but having the nerve to present this as a full retail game is inexcusable. It's simply not finished, and it certainly isn't worthy of being considered a legitimate followup to Aliens. As a story, it's inconclusive, riddled with cliches, and underwhelming. As a game, it's incoherent, insubstantial, and blatantly unconsummated. It took over five years for me to finally play this game, and less than five hours to feel nothing but a shocked emptiness at the thing I'd first downloaded with feverish anticipation. Multiplayer raises the game's stock, but not by much. Certainly not enough to be worth the time of any Aliens fan, when there are cheaper, more professionally produced alternatives on offer. This feels like an amateur's dalliance, not a high profile mainstream release that's been in production since 2006 and heralds itself as an important addition to science fiction history. It works, just about, and it comes across as a game developed to attain that one lowly goal -- to simply work, to achieve the bare minimum quality required to escape being labeled unplayable. The result is something that is, indeed, playable, but nonetheless heartbreaking in its awfulness. At first, Colonial Marines surprised this lifelong Aliens fan with its ignoble crudity. Then it angered me. Now ... I'm just very, very sad. I don't even feel like ending this with an obligatory movie reference.